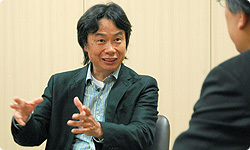 Now, I’d like to ask you about the software component of Wii Fit. Normally, when creating software for bathroom scales, you usually choose to have it calculate one’s body fat percentage as well. We actually stuck with calculating the body fat percentage for quite a while, but we dropped it in the end. Since that was when the key word “balance” came up, we concentrated on making the best use of the concept. Ironing out the concept of the software and wrapping it up concisely is one of the keys to development. The things you could do with the Wii Balance Board developed in several directions, with some sections organised as Balance Games16, some as Aerobic Exercises17, some as Muscle Workouts18 and others as Yoga19. Were those the categories you started off with? 16 Games designed to improve your sense of balance. 17 Exercises that encourage the burning of fat in the body. 18 Exercises to tone up certain muscles of the body. 19 Exercises where you stretch your body to improve your posture. At first, we hadn’t categorised it that much. First when we were doing various experiments, we decided there would at least be games. After that, we decided to add yoga. Yoga was originally part of a separate plan from Wii Fit. Yoga was undergoing an upsurge in popularity in Japan at around the same time as we were conducting the planning meetings, so there was a staff member who wanted to make yoga-related software. But I rejected it outright by saying, “You can’t just put something into a product because it’s popular, you know! It might look like a good plan, but it’s no good as a product.” Still, when we were putting Wii Fit together, we thought “Let’s include the staff member who was toying with a piece of yoga-related software too.” (laughs) I said, “The yoga software is starting to make sense with the Wii Balance Board.” As a result, he took part in not just the yoga section but the development of the rest of the package as well. (laughs) Yoga became one of the categories, but we still had to work hard on addressing the balance between the other three. First we thought of many training routines that you could do with the Wii Balance Board and had a professional trainer, Mr Kaoru Matsui, assess them for us and eliminate the ones that would be less effective. At the same time, we asked him to recommend routines for us to implement. That was how we decided which activities to include, one after another. That reminds me a lot of Dr Kawashima's Brain Training20. We created a lot of training exercises for that piece of software and then asked Dr Kawashima21 to judge and identify the ones which worked and the ones which didn’t. We had a bit more experience when we made More Brain Training, so of all the ideas we submitted to him many more were successful and were accepted after the approval process. A lot of our ideas were rejected and not incorporated for the first one though. 20 Dr Kawashima's Brain Training: How Old Is Your Brain? is a piece of software for the Nintendo DS that offers many brain training activities and was released in South Africa in 2009. It was followed by More Brain Training from Dr Kawashima: How Old Is Your Brain? 21 Dr Ryuta Kawashima, a Japanese professor, oversaw the production of both pieces of software in the Brain Training series. Hoop Twirl exercise to the same section later on. Once we’d done so, that section really began to take shape, and just when we were starting to think about adding something else to the line-up, I just happened to see an experiment done by the Wii Sports team. Jogging activity, in which you jog with the Wii Remote in your pocket, came from? That’s right. I thought it was pretty good fun. 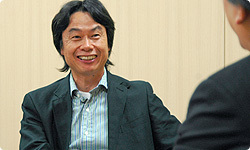 As we didn’t know if there was going to be a Wii Sports 2 at the time or not, I gave the director a call and said to him, “This idea’s really good, and since there’s no official word on Wii Sports 2, could we have it for Wii Fit?” (laughs) Then I told the Wii Fit staff “I know it’s a little late in the project, but put this in too”, and the Aerobic Exercises selection finally started to meet our standards. That’s a classic example of putting a good idea to great use. As a result, the Wii Fit staff members were swamped with work, so I asked the Wii Sports director to lend me a programmer as well. (laughs) This all happened at the very end of the development process, but being able to do things like this is one of the great things about EAD. Even with someone else in charge, the programmer helped a lot and got on well with the other team members. Everyone got along relatively smoothly in that regard. As it doesn’t use the Wii Balance Board, it deviates from our original production rules, but I thought that if we had several good games that you didn’t need to use the Wii Balance Board for that were fun, then it wouldn’t really matter. You broke the rules of the project yourself! (laughs) But the way you did it actually ends up giving the game a sense of variety. Also, I think there’s a huge difference in the impression you get between having Hoop Twirl under Aerobic Exercises as opposed to, say, having it under Balance Games. I took a lot of care with regards to how the customers would see it. Normally, I’m pretty picky when it comes to making the manuals, but this time I was even more picky than usual. I paid a lot of attention to how the developers would have wanted the product to be seen by the customers. Wii Fit is a new kind of software that’s unlike anything that’s been done before. We really wanted to stress this in the manual so that new customers who purchase the product who’d never read a game instruction manual before, could understand. That’s why when you get on the Wii Balance Board, the Wii Balance Board character22 tells you all sorts of things on-screen. I can’t get enough of that. (laughs) 22 An on-screen Wii Balance Board character, who is a cute anthropomorphised version of the Wii Balance Board. At first, someone asked “Why not have sounds when you get on the Wii Balance Board?” So we experimented with that, and found it was more fun making the sounds with your feet. If it didn’t say anything, it’d just be normal bathroom scales, but if you get on this every day and hear the Wii Balance Board character speak, you might eventually get quite attached to it.